A group of community-minded businessmen emerged from a meeting nearly 20 years ago, committed to help their struggling city make a comeback. Each put up a significant amount of their own cash to try to redevelop a sleepy downtown with numerous shuttered storefronts and buildings. 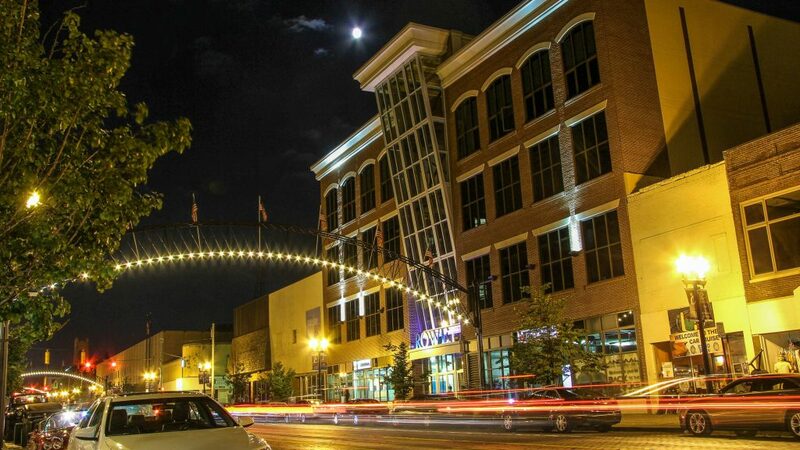 The investors formed Uptown Six LLC in 2001 and Uptown Developments LLC came a year later – entities responsible for much of the changing face of downtown Flint and the jolt in economic activity over the past nearly two decades. Their restoration and re-creation of buildings in six projects led to more than $38 million in total project investments. The projects have helped bring about 320 new employees downtown, plus new residents with the creation of loft apartments. Today, four private sector investors remain (Troy S. Farah, Gary J. Hurand, Ghassan M. Saab and Phil Shaltz) and since 2009 they have worked as Uptown Four LLC. Shaltz recalled getting involved because his own children, then in their early 20s, had left Flint, along with other friends’ children. Tim Herman, CEO of the Flint & Genesee Chamber of Commerce, credits the four visionaries and their risk taking with leading downtown’s reinvention. “These four pioneers have spurred development by other developers in town. And because of what’s happening in downtown, it’s now drifting into the neighborhoods…,” said Herman, also President of nonprofit Uptown Reinvestment Corp. (URC), which has partnered with the Uptown investors on projects and spearheaded its own downtown projects. The four investors have spent more money than they ever intended. Some original members (Al Kloss, Laval Perry and George Falaras) left the group over the years for various reasons. Shaltz, president of Shaltz Automation Inc. in Flint Township and the group’s spokesman, said when they started each member agreed to invest a certain dollar amount and no one was to issue a personal guarantee on a project. “We have blown way past that,” Shaltz said of both rules. The group also agreed not to give up, he said. There were hiccups along the way, most noticeably the partial and costly collapse of the Rowe Building during construction in August 2007. Despite the learning curves and challenges, there are no regrets, and instead a sense of accomplishment, said Saab, CEO of Sorensen Gross Construction Services in Flint. “We feel that we’ve made a difference,” Saab said. A turning point was Blackstone’s Pub & Grill opening in 2009. Why? They had accomplished buy-in from others, Shaltz said. The investors say they are grateful for help received from the Charles Stewart Mott Foundation. Ridgway White, now the Mott Foundation president, was then a loaned executive to URC serving as a project manager for many of the transformational projects, including the Riverfront Residence Hall, the health & wellness district and others. 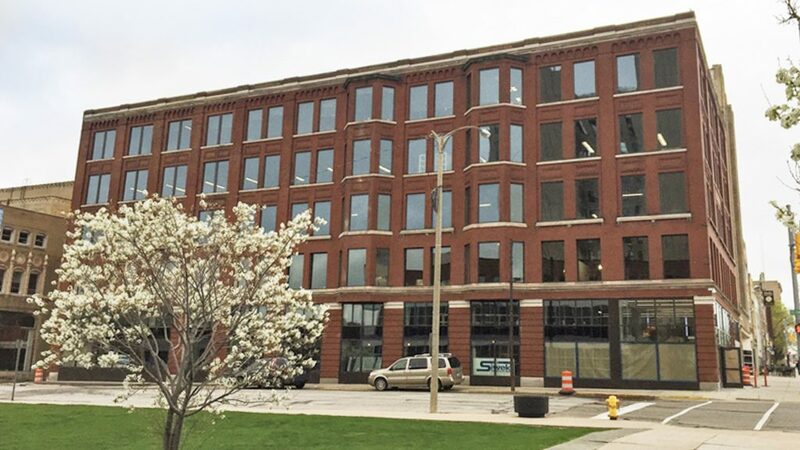 Their efforts also helped to spur other redevelopment, including Phil Hagerman’s Skypoint Ventures, which recently renovated the Dryden and Ferris buildings. David Ollila, president and chief innovation officer at Skypoint Ventures, said without Uptown Developments’ work it might not have made sense to buy the Dryden and Ferris buildings. “If the Uptown folks had not done what they did in acquisition and renovations of buildings, it might not have been enough of a tipping point to bring in further investment,” Ollila said. Uptown Developments’ first completed project in 2005 was a $590,000 renovation of the old Economy Building into first floor retail, second floor office and third-floor apartments. Then came First Street Lofts, the Community Foundation of Greater Flint Building, a new Wade Trim Building and the Rowe Building. The last project completed was the $3.5 million Genesys Downtown Flint Health Center in 2013. 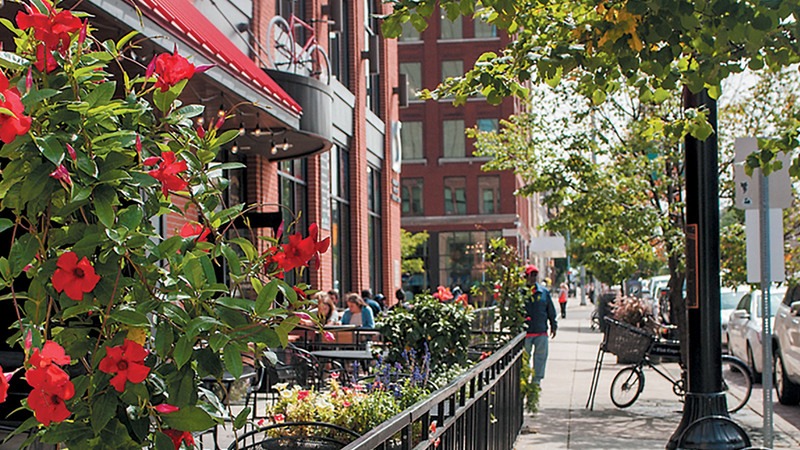 While much has improved downtown, Farah, managing partner in real estate private equity firm West Second Street Associates in Flint, wants to see more UM-Flint students frequent downtown businesses and unsubsidized private sector projects. 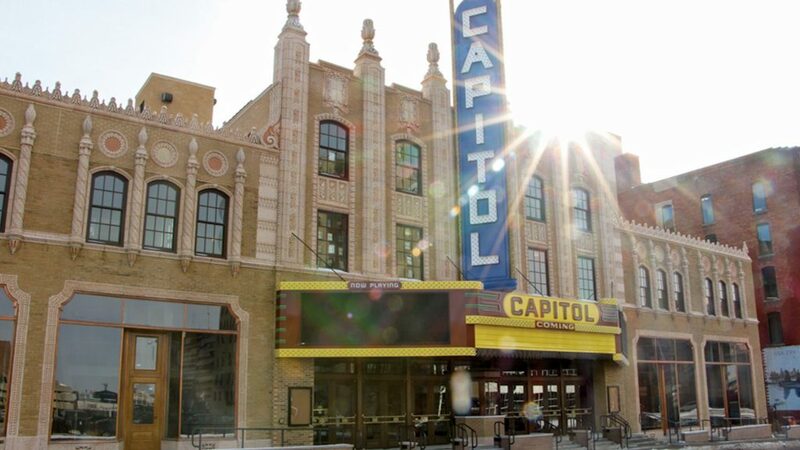 The reopening of the long-shuttered Capitol Theatre may help. Farah’s father, George Farah, bought the Capitol in 1977. The $37 million restoration of the Capitol, led by URC, was completed in December 2017. “It will be a tremendous economic generator due to the projected 100,000 visitors per year,” Troy Farah said. And more growth appears on the horizon. Skypoint plans to add a restaurant in the Dryden and is working with a partner to develop the empty Universal Building. 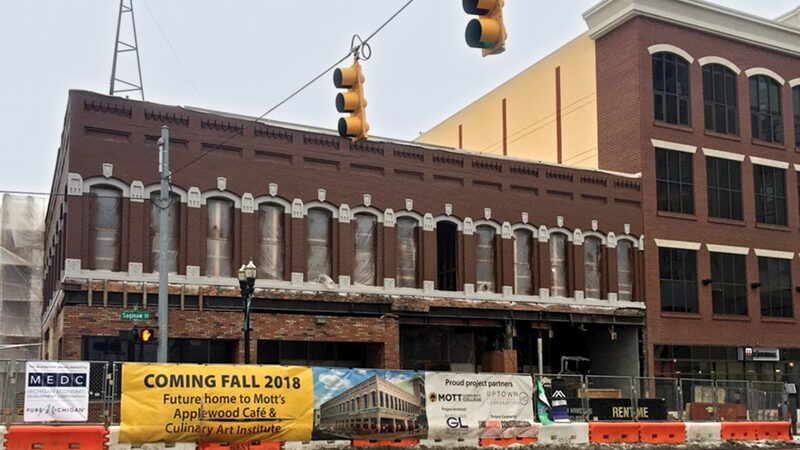 Uptown Reinvestment, whose projects include the Flint Farmers’ Market, Michigan State University College of Human Medicine and the Mott Community College Culinary Institute project under construction, is working to bring a hotel downtown and an anchor tenant to the former Perry Drugs Building. It’s possible the Uptown Four could be involved. Shaltz says Uptown Four remains dedicated to making downtown successful.